Deciphering an ingredient list is one of the best skills to develop when switching to a processed-free eating style. Many of you have become very good at this skill, as evidenced by the many questions I receive asking about ingredients that appear on even some of the organic foods found in natural food stores. One question that keeps coming up is about ingredients in baby formulas. Are there any safe baby formulas on the market? If so, which ones are the best? This is a very difficult question to answer because the truth is that most conventional baby formulas on the market contain sugar, soy, pesticides, preservatives and GMOs. Even many of the organic baby formulas are not as healthy as they should be. Because of this, I tell parents that the best solution is to make their own baby formula (I’ll get to that in a minute), but if making your own formula is not an option, a canned or powdered formula may be necessary. 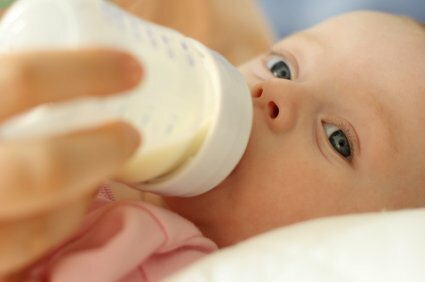 If you have to buy formula, there are some things every parent should know and understand about the ingredients baby formula manufacturers are using in their products. First and foremost, you should definitely pass on any infant formula that is not organic. Because of the toxic effects of herbicides, pesticides and genetically modified foods (GMOs) in non-organic commercial formulas, they are not a healthy option for the delicate and still-developing immune system and organs of babies and infants. Several of the ingredients in conventional formulas derive from GMO’s such as milk, whey, lactose, soy oil, soy lecithin, corn syrup solids, sugar (from sugar beets), ascorbic acid (from corn), maltodextrin (from corn) and others. Most conventional milk-based formulas are made with milk from cows injected with the genetically engineered bovine growth hormone rBGH (also called rBST) that is used by the U.S. dairy industry to increase milk production in cows. This controversial hormone, which is banned in Canada, Europe, Australia, and Japan, and condemned by the American Public Health Association, produces high levels of the cancer-promoting hormone, IGF-1, in the milk. This hormone has been linked to breast, colon, and prostate cancers. Non-organic soy-based formulas are made from GMO soy, which may be just as harmful as GMO milk. Soy and other GMO’s have been linked to compromises in immune function which can take place prenatally and early in life. They have led to an alarming increase in the rate of childhood disorders including allergies, autoimmunity, neurological disorders (Autism and ADHD), growth failure, and hormonal disruptions. If danger from GMOs isn’t enough, the herbicide used on GMO corn and soy inhibits the activity of a group of enzymes in the liver that are important for detoxification. In a baby’s body, full maturity of the liver takes approximately two years, thus a baby’s body is not able to perform normal detoxification and other functions as well as an adult. Exposing babies and newborns to substances that further impair liver and immune function leads to increased health risks. Since 2002, most manufacturers of baby formula, both organic and non-organic, have fortified their formulas with synthetic versions of DHA and ARA, two important nutrients for brain and eye development that are naturally found in human breast milk. DHA (docosahexaenoic acid) is an omega-3 fatty acid and ARA (arachidonic acid) is an omega-6 fatty acid. The synthestic versions of DHA and ARA added to most brands of baby formula are extracted from factory-produced C. Cohnii and M. Alpina—specific strains of algae and fungus that have never been part of the human diet, let alone the diet of infants. The chemical structure of laboratory-grown DHA/ARA isn’t the same as human DHA/ARA. They aren’t a perfect match for breast milk because breast milk contains hundreds of other components that can’t be replicated. A Cornucopia Institute report has determined that these additives are not necessary and are primarily added as marketing tools. Several comprehensive reviews all conclude that DHA and ARA “had no proven benefit regarding vision, cognition, or physical growth.” However, they did have some negative effects. When the C. Cohnii and M. Alpina oils first appeared in infant formula, the Food and Drug Administration (FDA) received dozens of reports from physicians and parents who noticed diarrhea, vomiting, and other gastrointestinal distress in infants given formula with these oils—symptoms that disappeared when the infant was switched to the exact same formula without the synthetic additives. Another concern with these additives is how they are produced: the oils are extracted from the algae and fungus with the use of hexane, a neurotoxic petroleum-based solvent. 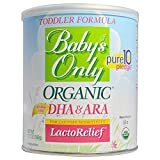 Unfortunately it’s tough to find an infant formula without added DHA/ARA, even if it’s organic. With all the problems associated with ingredients in conventional baby formulas, organic is definitely the way to go, but you still need to be careful! Read ingredient lists! Organic formulas can contain refined sugars, synthetic vitamins and synthetic antioxidants that may not be healthy for your baby. Which one is the best? According to the Cornucopia Institute’s online guide on formulas Baby’s Only Organic (products listed below) is the only brand that is non-GMO and hormone-free and does not contain the DHA/ARA described above. Baby’s Only Organic is intended for a toddler 1-year of age or older OR as directed by a healthcare professional. According to its manufacturer (Nature’s One), Baby’s Only Organic formulas “provide the correct balance of proteins, carbohydrates, essential fatty acids, vitamins and minerals to support normal growth and development of a young child.” Since the company encourages breastfeeding infants, it doesn’t typically promote Baby’s Only Organic as an infant formula, although many happy customers have used it as such with no adverse effects. Unlike other organic baby formulas that use organic sugar or evaporated cane juice (which, by the way are still refined sugars), Baby’s OnlyOrganic uses brown rice syrup as its source of carbohydrates. There were some concerns that the older version of its formula was found to contain elevated levels of arsenic due to environmental contamination of brown rice. In response, Nature’s One developed an organic-compliant technology to filter and remove arsenic from its organic brown rice syrup to undetectable levels. Consumer Reports has confirmed that Baby’s Only Organic formulas have undetectable levels of arsenic. So while organic baby formula is not perfect, it is still a far better choice than conventional formula. 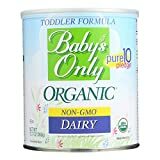 In my opinion, from what I was able to see, Baby’s Only Organic is the best one on the market. Now, I mentioned earlier that I think the best alternative is to make your own baby formula. Two knowledgeable women from the Weston A. Price Foundation, Mary Enig and Sally Fallon, wrote a book called Nourishing Traditions, which teaches you how to prepare foods in the healthiest ways. One of the recipes in their book is for homemade baby formula. This recipe has been embraced by many bloggers who follow the Weston A. Price principles and the Nourishing Traditions book. I have seen the exact recipe on dozens of blog sites. Mothers who cannot breastfeed for whatever reason rave about this recipe and are grateful to have found it. One such blogger, known as The Healthy Home Economist has a great video that shows you how to make the formula. Another blogger, known as Cheeseslave, has a wonderful picture tutorial on how to make the recipe, along with her helpful notes on how to make the formula. One thing that Cheeseslave mentions that I think will be helpful to many parents, is that although the original recipe calls for raw milk, you can substitute whole organic milk or goat milk if necessary. I would add that you should look for an organic milk from grass-fed cows that is not ultra pasteurized. Brands such as Organic Valley Grassmilk, or organic milk from regional dairies like Kalona Supernatural milk that use a low heat pasteurization are the best. The other ingredients for the baby formula include coconut oil, cod liver oil, sunflower oil, olive oil, lactose powder, nutritional yeast, gelatin, infant probiotics, and acerola powder. These ingredients may seem strange, but trust me they are wonderful and provide all the nourishment a developing baby needs. Healthy Home Economist mentions on her webpage that these ingredients can be purchased as a kit from Radiant Life, an online store that sells foods and supplements that are in alignment with traditional foods. I hope this information has given you a new way of looking at baby formulas. I wish there was an easier answer to the “which is the best baby formula” question, but there just isn’t. True heath is something that we have to spend time learning about and time making in our kitchens. It doesn’t come in ready-to-feed containers.